A capo isn't really essential to begin with, although it can help tremendously once you have learned some chords and are playing along with songs that use them. 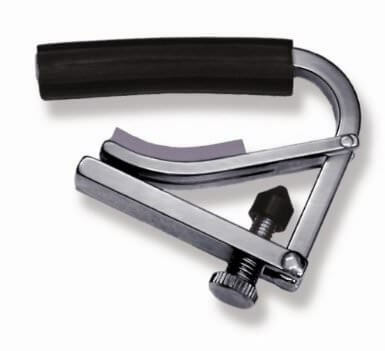 A capo is simply a clamp that will hold down all of your guitar strings for you at one fret. You can move it up and down the neck to easily change key. I use the Shubb guitar capo because it is compact and does the job nicely. Some other capo designs can put too much/uneven pressure on the strings and cause them to go out of tune.